[210 Pages Report] The sample preparation market comprises products used to prepare biological as well as chemical samples for the analysis of raw materials or final products primarily to determine the presence of unwanted materials. Sample preparation instruments, workstations, and consumables serve the purpose of the production of a homogeneous sub-sample, representative of the material submitted to a laboratory. The market is expected to grow at a CAGR of 5.5% during the forecast period to reach USD 7,203.2 Million by 2021 from an estimated USD 5,512.2 Million in 2016. The market growth can be attributed to increasing research activities in genomics, shift from manual sample preparation to workstations, global alliances among leading research institutes to boost drug discovery, rising adoption of modern extraction techniques, technological advancements in analytical instruments, increasing life sciences R&D spending, and increasing need for food analysis due to safety concerns. 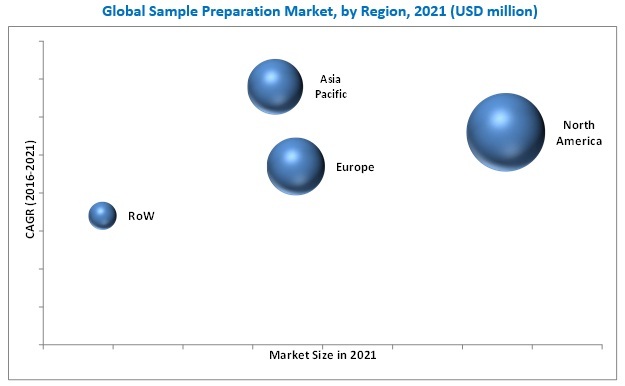 Some of the prominent players in the sample preparation market includes Agilent Technologies, Inc. (U.S.), Danaher Corporation (U.S.), Illumina, Inc.(U.S.), QIAGEN N.V.(The Netherlands), PerkinElmer, Inc. (U.S.), Bio-Rad Laboratories, Inc. (U.S.), Thermo Fisher Scientific, Inc. (U.S.), Norgen Biotek Corporation (Canada), Hamilton Company (U.S.), Tecan Group Ltd. (Switzerland), Merck (U.S.), Promega Corporation (U.S.), and Roche Applied Science(U.S). The global sample preparation market is projected to reach USD 7,203.2 million by 2021 from USD 5,512.2 million in 2016, at a CAGR of 5.5%. This growth can be attributed to factors such as increasing research activities in genomics, shift from manual sample preparation to workstations, global alliances among leading research institutes to boost drug discovery, rising adoption of modern extraction techniques, technological advancements in analytical instruments, increasing life sciences R&D spending, and increasing need for food analysis due to safety concerns. The sample preparation market comprises products used to prepare biological as well as chemical samples for the analysis of raw materials or final products primarily to determine the presence of unwanted materials. Sample preparation instruments, workstations, and consumables serve the purpose of the production of a homogeneous sub-sample, representative of the material submitted to a laboratory. The sample preparation market has been segmented, on the basis of product, into workstations/systems, consumables, and accessories. The consumables segment is estimated to witness the highest CAGR during 2016–2021. The high growth can be attributed to the recurring purchase of these products. The consumables segment of the global sample preparation market is broadly segmented into kits, columns, filters, tubes, plates, and other consumables. By applications, the market is broadly segmented genomics, proteomics, epigenomics and epigenetics, and other applications. In 2016, the genomics segment accounted for the largest share of the sample preparation market. The largest share of this segment can be attributed to a number of automated solutions that are emerging for improving sample preparation process efficiency and quality in various genomic applications, such as DNA extraction, normalization, PCR setup, DNA shearing, and next-generation sequencing. Automation reduces errors and thus reduces the cost per PCR test, thereby driving the market. By end user, the market is segmented into pharmaceutical and biotechnology industries, research and academic institutes, food and beverage industry, and other end users. In 2016, the pharmaceutical and biotechnology industries segment accounted for the largest share of the sample preparation market. With continuous research activities in pharmaceutical and biotechnology companies, there is a greater focus on the introduction of new technologies in the market. In this regard, sample preparation techniques aid in providing rapid analysis, and accurate results while handling different and multiple samples. Geographically, the North American market accounted for the largest share of the global sample preparation market in 2016. The large share can be attributed to factors such as steady increase in laboratory spending, advances in forensic sciences, and initiation of the Genomic Applications Partnership Program (GAPP) as well as the growing food testing industry in Canada are some of the key factors driving the growth of the sample preparation market in North America. Sample preparation automated instruments include workstations/systems and liquid handling systems, extraction systems and other instruments such as tissue lysers, tissue disruptors, and homogenizers. Automation in sample preparation instruments has eliminated the need for manual and tedious tasks such as pipetting, reagent dispensing, plate washing, and liquid transport within the lab for processing and storage. It improves reproducibility, reduces errors and sample contamination in multi -user labs, and conserves expensive reagents used in medical testing, biological research, and high-throughput screening labs. Sample preparation consumables form a part of the internal assembly of the system; they include kits, columns, filters, tubes, plates, tips, and syringes. They are of single use and require to be purchased again for every procedure as opposed to the instruments. What are the upcoming applications for sample preparation systems? QIAGEN N.V. (Netherlands), Thermo Fisher Scientific, Inc. (U.S.), PerkinElmer, Inc. (U.S.), and others Agilent Technologies, Inc. (U.S.), Danaher Corporation (U.S.), Hamilton Company (U.S.), Sigma-Aldrich Corporation (U.S.), Norgen Biotek Corporation (Canada), Millipore Corporation (U.S.), Bio-Rad Laboratories, Inc. (U.S.), Roche Applied Science (Switzerland), Illumina, Inc. (U.S.), and Tecan Group Ltd. (Switzerland) are the leading players in the market. 9.13 thermo Fisher Scientific, Inc.